You’ve heard the success advice before: “Raise your hand for every opportunity.” “Volunteer for more projects.” “Say yes to everything.” And that’s all great, with one exception. It’s stupid. (Okay, “stupid” is a bit harsh, especially for a nice person like me. Let me think again . . hmmm. . .) No, it’s still stupid. Here’s why. We live in a time of great opportunity. Lots of amazing things to say yes to. Tremendous opportunities to learn and grow. Everyone has a good idea to pursue. And there’s lots to do in our fun, fast, and fantastic world of work. And because you’re valuable, talented, and sweet-smelling, they want you involved. And you will always add value. Make things better. But at what cost? Because when you say “yes” to too many things, you end up saying “no” to the most important things for you. Your primary goals or growth agendas get pushed into tiny corners of time in-between meetings, conference calls, and commutes. Your sleeping habits, healthy eating, or regular walks outdoors can go back-burner fast. You end up sacrificing you. To really stay focused working in our superpower space—the place where we’re bringing our best and highest contribution to our work and our lives, where we feel clear, confident, and in control—we have to get better at saying no. 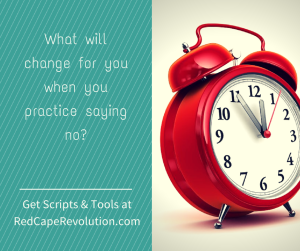 Many times, my coaching clients will know what they want to express, but aren’t sure how to say it. Inspired by their struggles and desires to do the right thing and say no (without destroying their careers), I’ve created 13 different ways you can put the right words in your mouth to say NO at work. I’m not promising all of these are appropriate at every time. But they’ll work more often than not speaking up at all. So I’ll trust you to use your judgment, do some experiments, and see what can happen for you. 1. No, thank you. Yes, “no” is technically a complete sentence—-I like the thank you ’cause I’m friendly. After saying no, shut up, shut up, shut up. Don’t offer an explanation; wait for a question or followup. Let there be space for discomfort. Most people won’t push past your confidence. 3. It sounds interesting, but it’s not on my list of priorities right now. 4. Based on what you’ve shared so far, I know I don’t have capacity for it. 6. Do you get pulled into projects outside your superpower space because you’re copied on a mass email and you’re just trying to help? Ignore the urge to jump in on the mass email conversation and offer an opinion/advice on a problem that someone else is accountable for. When you offer it, you’re in it. Instead, go directly to the person and say, “Do you have all the input you need on the XYZ issue that was going around in email? If you still need ideas, I had a few, but know you probably have it handled by now.” Let them decide if they need help rather than you assuming your help is wanted. You’ll be valued even more for giving them the respect to choose. 7. Based on the agenda, it doesn’t look like I’m really needed at that meeting, so I’ll take a pass. Thanks for including me. 8. I’d love to contribute, but right now I’m laser focused on everything that has a direct connection to my goal of X, so I’ll have to take a pass. 10. Thanks, but I’m not the right person for that. Do you want to take five minutes now brainstorming together about who is? 11. I hear you say you want to do X. As I look at it, if we add X to the scope of this assignment, we’ll compromise our priority of Y. So if Y is still our priority, we’ll need to say no to X. 12. I don’t see that we can successfully complete it sooner than planned unless we make changes to the timeline. Do we want to revisit the timeline together now? What parts can we change or drop? 13. I’m focused on serving our company’s best interest of [goal here]. With that in mind, no, it’s not in our best interest for me to take on Z right now. I’m happy to revisit it [next month, next quarter, next fiscal year]–do we want to put a check-in meeting on the calendar to look at it again then? Good advice, will try some of these! Thanks, Lauren! Be sure to tell us how it’s going! Thank you so much for all of the TIPS. My confidence is growing more and more. Too many people do not know when or how to ‘push back’ at work. 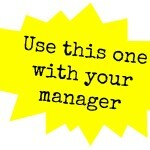 There is a never ending mountain of work, yet it is often poor management by imposing too much on employees. Managers needs to understand workloads of employees as it can impact on motivation and work will not be done thoroughly as employees with be rushing to complete something rather than do something well. Thanks for your thoughts, Nick. While I think there’s a lot managers can do to think differently about the work, I do think that each one of us needs to question everything we’re doing and whether it’s truly needed. I’ve worked with senior level leaders who have gotten in the default trap of just taking on every initiative that comes along, when all along they had the power to push back and say no –or at a minimum, force the question about what’s the most important thing that the organization needs them to do right now. More is negotiable than we think! Thanks for sharing your thoughts.